HEJSupport co-signed a joint letter to the delegates of the EU Parties to the Stockholm Convention. The Conference of the Parties will meet end of April in Geneva to discuss the listing of new substances and the specific levels of brominated flame retardants, dioxins and other persistent organic pollutants in recycled materials and wastes. Download the joint letter here. 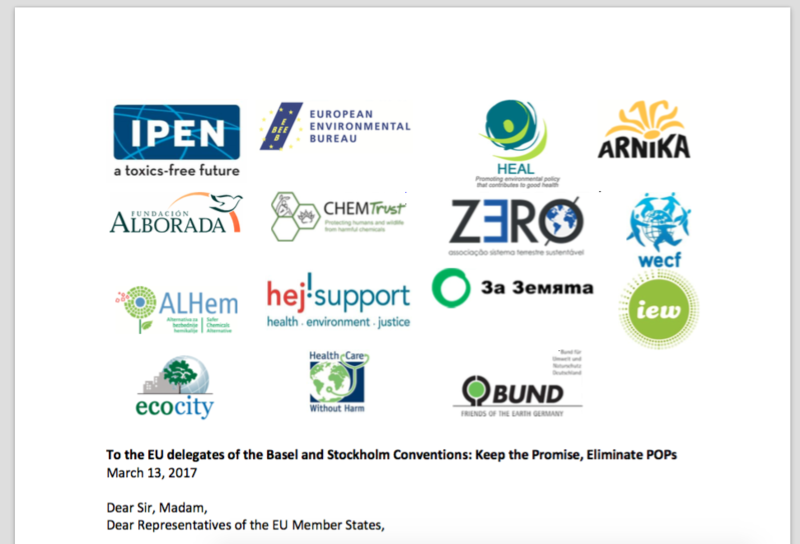 We are writing to urge you to support decisions at the upcoming Triple COP that uphold Convention principles and EU commitments to protection of human health and the environment. Two key decisions at the Basel and Stockholm Conventions are 1) determination of low POPs content level; and 2) listing of new substances in the Stockholm Convention. For a circular economy, it is critical that hazardous substances be eliminated from the circle. Unfortunately, at the international level the EU has a poor track record on this issue by repeatedly promoting toxic recycling policies under the Stockholm Convention. We urge the EU to take a clear position against recycling materials containing polybrominated diphenyl ethers – the PentaBDE, OctaBDE or DecaBDE – at the 8th meeting of Conference of the parties to the Stockholm Convention (COP8) (please see Annex 1). The Stockholm Convention requires treatment of POPs waste above the low POPs content level so that it no longer exhibits POPs characteristics. The proposed and provisional levels for polybrominated diphenyl ethers (PBDEs), hexabromocyclododecane (HBCDD), and dioxins and furans (PCCD/F) create a loophole that allows for disposal options that may be less costly initially, but that leave behind substantial POPs residues that result in significant costs and harms to human health and the environment. We request the EU to support low POPs content levels of 50 ppm for PBDEs, 100 ppm for HBCDD, and 1 ng WHO-TEQ/g (1 ppb) for PCCD/F (please see Annex 2). COP8 will decide on listing Decabromodiphenyl ether (DecaBDE), Short-chain chlorinated paraffins (SCCPs), and Hexachlorobutadiene (HCBD) in the Convention. HCBD should be listed in Annex C to trigger the work of the BAT/BEP expert group. SCCPs should be listed in Annex A with no exemptions along with an additional requirement to limit of SCCPs in other chlorinated paraffin mixtures. As noted in previous letters, the proposed DecaBDE exemption for auto spare parts is not justified as the industry can retrofit new parts that do not contain DecaBDE. A major airplane manufacturer has signaled that no aviation exemption is needed and numerous technically and economically feasible alternatives are available. We urge the EU to support the listing of these substances without specific exemptions (please see Annex 3). We expect the EU to be a leading proponent for protecting human health and the environment globally. Thank you for consideration of our views. IPEN report: Toxic Toy or Toxic Waste? Recycling of POPs into new products.